If you’ve tried to make the Easy Dulce de Leche recipe I posted a few weeks ago, you would have realised two things: 1. It is not hard to find excuses to put it on everything and 2. it tastes awesome straight from the jar. But if by some small miracle you actually find yourself with some dulce de leche left over, you absolutely must try making one of these awesome pies – because by adding only 4 simple ingredients which you will likely already have in your kitchen, you will have yourself an absolute crowd pleaser. Also, who doesn’t love a dish with a portmanteau name (word mash-up). 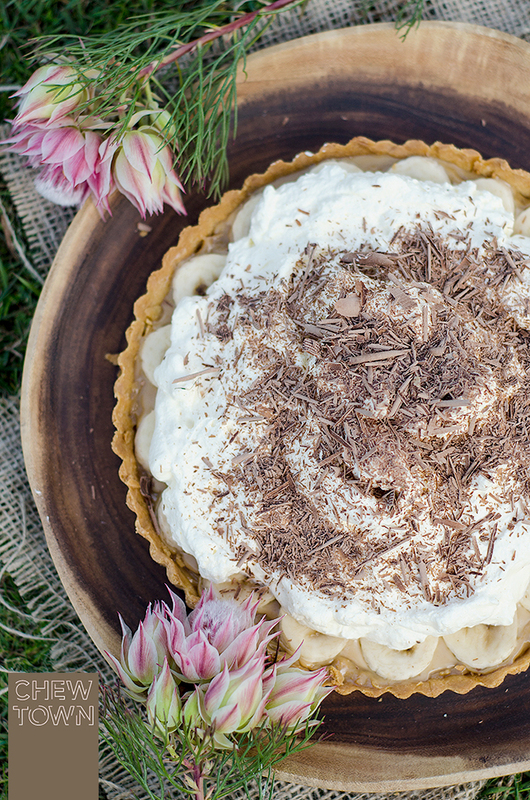 Banoffee Pie is named such after its two main ingredients of Banana and Toffee which = Banoffee. The pie itself has an interesting story. The birthplace of it is attributed to The Hungry Monk Restaurant in East Sussex, England, which sadly is no longer in business (it closed in 2012 after 44 years of operation). The chef’s original recipe was subject to so many variations around the globe that he has published the original recipe online after the restaurant closed as he is pedantic about people knowing the original and true recipe (it is reported that he frowns upon versions of his pie with a biscuit base). I’m not really fussed about whether you use a biscuit base or not, but if you are wanting to create a dessert in a hurry, then with some dulce de leche to hand, frozen shortcrust pastry, cream, chocolate and bananas… you have all you need. Grease a 22cm removable base tart tin and then carefully line the tart tin with the pastry. Line the inside of the pastry with baking paper or foil and fill to the top with baking weights or a dried pulse. Cover and place in the fridge for 30 minutes before baking in a preheated oven at 180° Celsius for 15 minutes or until golden. Spread the dulce de leche over the base of the pie then slice bananas diagonally and lay them on the toffee in one layer. Whip cream till light and fluffy then spoon the cream over the dulce de leche and bananas. Take the block of dark chocolate and and turn on its side. Using a vegetable peeler, gently run the peeler down the side of the block to make chocolate curls. Sprinkle over the cream and serve. The last time I ordered a banoffee pie at a restaurant it was a huge let down, which is a bit unforgivable because as you say, there’s really only 4 main ingredients and who could stuff up a dulce de leche?! I might have to try my hand at it to get a more satisfying result 🙂 I love those flowers in your photo above – what are they?! I don’t often see the word “portmanteau” used much these days. And it’s such a wonderful word! As is this pie. Looks totally delish. Great food styling on the photos, BTW. Wow. Looking at this (and the thought of stuffing it in my face) makes me so happy. Yum, time to get cracking and make one! It’s so pretty 🙂 I don’t like banana but I feel like even I would tuck into this pie! Now this looks like the perfect dessert! Yum! dulce de luche. banana. chocolate. you really can’t get better! i’m drooling at the sight of your photos – you’re amazing! I’ve made this before 🙂 How easy and delicious is it! But I’m going to have to try your recipe next time because I didn’t use dulce de leche and really wish I did! I love banoffe pie, I have never tried to make one, as I still have fond memories from when i use to go out and eat it at a cafe near where I lived in Edinburgh. The brits do know how to make a good one. Yours looks very tempting, wish you could send me a slice in the post.